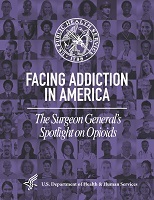 The Spotlight on Opioids assembles opioid-related information from the Surgeon General’s Report on Alcohol, Drugs, and Health into one document to better inform the general public, especially family and friends of people with an elevated risk of opioid overdose, opioid misuse, and/or opioid use disorder. Read the Spotlight on Opioids (PDF | 2 MB). Naloxone is used to temporarily reverse the effects of an opioid overdose. Expanding the awareness and availability of this medication is a key part of the public health response to the opioid epidemic. Read the Surgeon General’s advisory on Naloxone and Opioid overdose. Help, resources, and information is available to combat the National Opioids Crisis. 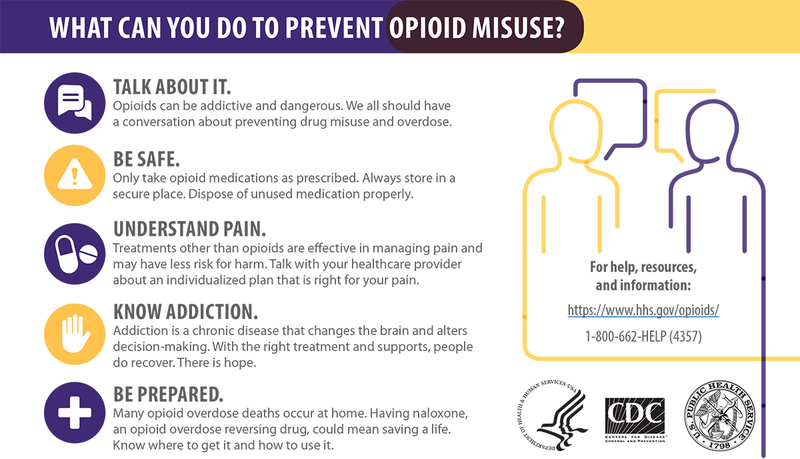 Learn more about available opioids resources. Supplementary materials are available that outline the Report’s key messages, highlight its findings and recommendations for specific audiences, and help you spread the word to others. Check out the supplementary materials.